One of the most popular subjects for an artist during the 19th century was cats and dogs. As the Industrial Revolution progressed and more people moved to the large cities, the number of people keeping cats and dogs as pets increased. With this increase more and more artists were called upon to paint charming and sentimental works featuring the domesticated animals. Arthur A. Brunel de Neuville was a French 19th century artist working in Paris who took up the call and devoted his artistic talent to portraying the different moods of cats and kittens. 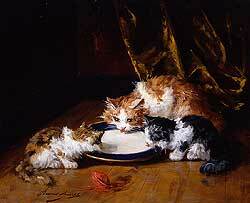 A typical scene includes a small feline family drinking from a bowl of milk, playing with a ball of yarn or toying with a bug. His animals are often set against a dark background, in the corner of a room, and are painted in a mixture of the Academic and Impressionistic styles. Brunel de Neuville also painted a number of still life paintings during his lifetime. These works are often rustic in feeling and definitely reflect the Realist tradition that was so prevalent during the late 19th century. As with many of his contemporaries, his work was very popular during his lifetime and he exhibited a number of works at the various exhibition halls. Today examples of his work can be seen in museums in Beziers, Brest and Chateau-Thierry.